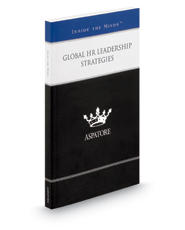 Global HR Leadership Strategies provides an authoritative, insider's perspective on leading the human resources function effectively in a rapidly changing business environment. Featuring articles by HR executives from some of the top companies around the world, this book addresses key concepts such as how to organize a strong team, ways to inspire employee engagement, and strategies to recognize, grow, and leverage talent to achieve business goals. From globalization trends to increasingly competitive market conditions, these experts identify some of the major opportunities and challenges HR professionals are facing today and analyze the long-term effect on future business strategies. Additionally, these experts illustrate the important role HR plays in championing a strong company culture that can align employees with company goals, increase collaboration, and achieve success even under the most challenging economic circumstances. The different niches represented and the breadth of perspectives presented enable readers to get inside some of the leading minds of today, as these top HR executives offer their thoughts on the evolving role of the human resources function in today's complex global environment.